Cousin BlackJack SquarePants – From SpongePedia, the biggest SpongeBob-wiki in the world! This article is about the character. For the episode, see BlackJack (Episode). Blackjack Curtis SquarePants is the cousin of SpongeBob SquarePants. So far, he has appeared in one episode: BlackJack. Blackjack is exactly the same size as SpongeBob, and he has muscular arms. Blackjack has a very gruffly voice and is circled shaped, compared to SpongeBob's square shape. 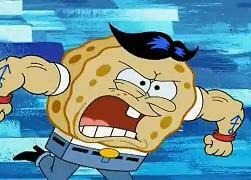 He dresses up in Biker-Gang clothing (white shirt, red wrist bands, blue jeans with belt buckle like SpongeBob's, and black cowboy-like boots). He has a pet worm, and lives in a cabin-like house only next door to his Uncle Blue SquarePants' house. Blackjack is known to be tough. Blackjack has not "changed a bit" as SpongeBob notes: He is actually the same size of SpongeBob and before the episode "BlackJack", before Blackjack sent SpongeBob a letter, Blackjack invented a remote and brought it with him while being set free from prison and he secretly used it to become the size of SpongeBob's foot before tickling it. The only strongest things he can do to SpongeBob is tickle his feet and other parts, wrestle him instead of using him as jump rope this time, and give him a noogie on the head. Cousin Blackjack is older than SpongeBob, and he used to be a bully to him. Blackjack also calls SpongeBob a "little man" not just because SpongeBob is younger than him, but due to the fact that SpongeBob used to not make any attempt to duel with him, and used to become scared stiff. Blackjack is known to be a powerhouse. SpongeBob's parents were not scared of him at all. In fact, they find it fun that they play and chat together. BlackJack went to prison for littering. This page was last modified on 18 June 2012, at 21:44.